In the last three years, Chicago has seen soaring rates of fatal overdoses from opioid analgesics – prescription drugs like oxycodone, hydrocodone and fentanyl, a synthetic opioid that is often produced and sold illegally. In 2015, there were 111 such deaths. Last year there were 448, according to preliminary data collected by the Illinois Department of Public Health. Among those who have abused prescription painkillers, “nearly 70 percent … had their first introduction to opioids from leftover medication from friends or family,” said Dr. Vivek Prachand, chief quality officer in the department of surgery at University of Chicago Medicine & Biological Sciences, where he also serves as executive medical director for procedural quality and safety. UChicago Medicine is not alone in that effort. Since the Centers for Disease Control and Prevention released its 2016 guidelines for prescribing opioids for chronic pain, area hospital systems have taken a number of steps to address the epidemic. Among their initiatives: changing opioid prescription protocols, educating patients and providers, decreasing access to opioids, and identifying and treating patients at risk of developing dependencies to these powerful drugs. We spoke with a dozen hospital administrators, doctors and specialists to get a closer look at some of those steps. Last year in Cook County, more than 1.5 million opioid prescriptions were written for 762,021 patients, according to state health officials. At Northwestern Medicine, Dr. Jonah Stulberg is working to reduce opioid prescriptions for surgical patients at the point of discharge by 50 percent. It’s part of a system-wide initiative, said Stulberg, a general surgeon at Northwestern Memorial Hospital who is leading the health system’s opioid-reduction efforts. At NorthShore University HealthSystem, a quarterly report ranks physicians based on the number of opioid prescriptions they’ve written – and identifies doctors who are prescribing significantly more than their peers. A lot of factors can influence a physician’s prescribing habits, says Dr. Lauren Oshman, who chairs NorthShore’s opioid task force. “We found that physician education and focused feedback in terms of these reports is an extremely effective way to help someone change their practice,” she said. Many hospitals are changing their approach to treating surgical patients by implementing various interventions and treatments designed to limit the use of opioids and “trick the body into thinking it’s not having surgery,” said Dr. Michael McGee, co-chairman of the enhanced recovery committee for Northwestern Memorial Hospital. It’s called enhanced recovery after surgery. Examples include giving patients non-opioid pain medications like Tylenol and ibuprofen before and after surgery, and using targeted, long-acting injections or nerve blocks during surgery that essentially numb the area and provide continued pain relief for up to a few days after the procedure. “We use opioids only to treat pain as a last resort,” said McGee. A year after implementing this type of protocol for colorectal surgery patients, NorthShore saw a 50-percent reduction in the number of patients using opioids during their hospital stay, according to Dr. Rebecca Blumenthal, an anesthesiologist who spearheaded NorthShore’s protocols. Other hospitals that have implemented enhanced recovery protocols say they’ve seen a drop in opioid use, as well as a reduction in patient complication rates, length of hospital stay and readmission rates. One of the pillars of enhanced recovery after surgery involves setting patients’ expectations for pain management. This does not mean the elimination of all discomfort, Prachand says, but the ability to “adequately manage the pain” so patients can have a “smooth and speedy recovery” with minimal side effects. It’s all part of patient education. Before surgery, patients are told what to expect from “the moment their procedure is scheduled through discharge,” said Blumenthal. This includes a layman’s explanation of what their surgery entails. At both Advocate and Northwestern, technology plays a role in keeping surgical patients informed and engaged. Emails and mobile push notifications remind them of upcoming appointments, and prompt patients to share the amount of medication they’re using after surgery. Education doesn’t stop with patients: Hospitals continue to train physicians and other health care providers on assessing patients’ pain and safely prescribing opioids. At Loyola Medicine, more than 3,000 first responders from 20-plus police departments across Cook County have learned how to recognize an overdose, and how to administer the overdose-reversing drug Narcan. This type of training is not just practical, but “a moral obligation,” said Dr. Mark Cichon, medical director of emergency medical services at Loyola. In an effort to keep unused opioid prescriptions out of the hands of recreational drug users, those with dependencies – or even Chicago’s water supply – University of Chicago Medicine and Northwestern Medicine have installed drug disposal bins in some of their clinics. To encourage patients to use the bins, opioid prescriptions filled through the University of Chicago pharmacy include stickers and labels reminding patients to bring their leftover medications to their first post-operative visit, where they can be safely disposed of. Last year, the University of Chicago collected a ton of medications through its disposal bins, according to Prachand. 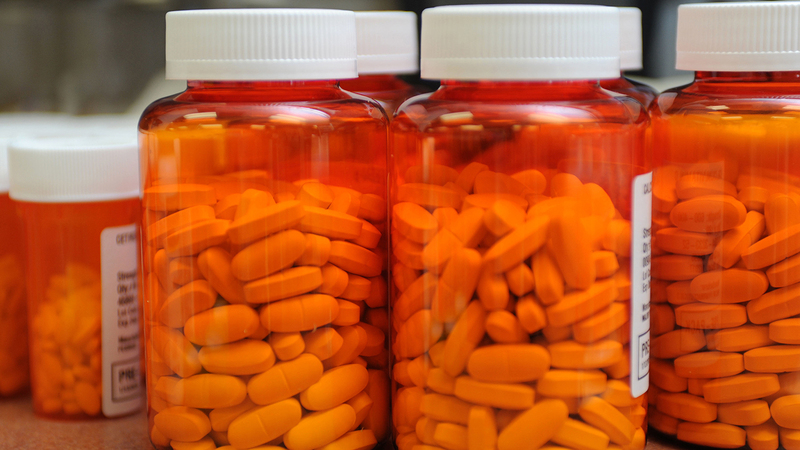 Cook County Health and Hospital Systems recently began using Safer Lock caps on prescriptions for not just opioids but all controlled substances. The locks require a patient to enter a four-digit code in order to open their pill bottle. Using these locks keeps medication in the hands of patients – not their family members, friends and acquaintances – said Dr. Maria Torres, chair of the division of pain medicine at CCHHS. Other hospitals are trying to limit the amount of opioids leaving their doors. In the emergency departments of Advocate Good Samaritan Hospital and Advocate Sherman Hospital, a pilot program aims to reduce the number of prescriptions for Dilaudid, described as “a more potent opioid” by Dr. Ronald Lawton, medical director of emergency medicine at Advocate Health Care and Medical Group. “Patients with opioid use disorder tend to prefer [Dilaudid] because it gives them a little more euphoria than other [opioids],” Lawton said. Patients addicted to opioids also know they’re more likely to get an opioid prescription from an emergency department – where staff might not know them or their prescription history – than their primary care provider, Lawton said. “We’re trying to stop that kind of behavior and make sure patients are going to the appropriate location for the treatment of their pain,” he said. And it seems to be working: Since the program’s launch, both sites are essentially Dilaudid-free, according to Lawton, with an 80-percent reduction at Advocate Sherman Hospital in the past year. “They reserve it for special cases – for example, trauma patients or cancer patients,” Lawton said. Both emergency departments are “seeing a reduction in the number of patients who come in just seeking pain medications,” Lawton said. To prevent so-called doctor shopping in emergency departments, Advocate relies on individualized care plans for those with complex or recurrent medical conditions, including those with opioid use disorders. The plans can be accessed from any Advocate location, so that when a patient enters an emergency department within its system, the attending physician is notified of the patient’s plan and treats them accordingly. Through these plans, “We can avoid any abuse of the emergency department to seek medications,” Lawton said. Advocate officials have noticed a decrease in the number of patients seeking medications from the emergency department once they have a plan. Rush University Medical Center now screens all patients for substance use disorders as part of the hospital’s intake process. Social workers further assess patients who admit to using illicit drugs. Those identified as having a moderate or high risk for addiction see an addiction specialist. “Our goal is to establish care in the inpatient setting, so for our opioid use disorder patients that means we try to start Suboxone, or buprenorphine, on every single patient that’s interested,” said Kathryn Perticone, psychiatric nurse practitioner and director of Rush’s substance use intervention team. Interested patients are referred to either inpatient or outpatient treatment based on their needs. Starting treatment immediately increases the chances a patient will continue treatment, said Perticone. Between November 2017 and March 2018, Rush screened for alcohol and drug use in nearly 80 percent of the 15,054 patients it admitted. Of those screened, 52 started buprenorphine to treat an opioid use disorder. “Oftentimes, if the reason they’ve come to the hospital is even tangentially related to their substance use, they’re probably going to have a little bit more motivation at that point to change, as opposed to when they’re outside and the substances are controlling their lives,” she said. As part of its efforts to prevent overdoses, Cook County Health and Hospital Services is educating patients who use opioids, including those with opioid use disorders, on how to use naloxone, the opioid overdose-reversing medication. CCHHS has even made the medication available in all its pharmacies without a prescription. For more than a decade, CCHHS has been treating substance use disorders – including an increasing number of patients with opioid addictions – with a combination of medication and behavioral health support. It’s called the medication assisted treatment program, or MAT. In response to the opioid epidemic, CCHHS has expanded this program, which had just “pockets of providers” before 2016, according to Dr. Juleigh Nowinski Konchak, who leads the program. As health care providers implement these steps, they realize there’s still more to work to do in order to stop the opioid epidemic. “It’s important for us to play a leading role in the solution, and I think because of that we can have a bigger impact and see a quicker and greater tide change,” said Stulberg.